Watch the Global Security Outlook session from the World Economic Forum's Annual Meeting 2017 here . The past year will be remembered for dramatic political results that broke with consensus expectations: Brexit, the surprise election victory of Donald Trump, the ongoing refugee crisis, increasing geopolitical tensions and the continued threat of terrorism all left their stamp on 2016. As the World Economic Forum looks at perceived risks in its 2017 Global Risk Report , some of these trends come out very clearly as pressing concerns for our future. In this year’s annual survey, some 750 experts assessed 30 global risks, as well as 13 underlying trends that could amplify them or alter the interconnections between them. The most pressing risks in terms of their likelihood to occur are dominated by respondents’ environmental and geopolitical concerns. Extreme weather events top the list this year, with natural disasters ranking third and man-made environmental disasters further down the order. A cluster of interconnected environment-related risks – including extreme weather events, climate change and water crises – has consistently featured among the top-ranked global risks for the past seven editions of the Global Risks Report. The second most likely risk is the impact of large-scale involuntary migration, which has featured strongly over recent years, not least because of the war in Syria. Terrorist attacks follow in fourth place, with other geopolitical tensions such as interstate conflicts (wars) and failure of national governance also making the top ten. Technology threats rank in the mid-field, with data fraud and theft in fifth place and cyber attacks in sixth. When asked to rate the risks with the biggest impact, geopolitical concerns around weapons of mass destruction top the bill. This is not surprising as 2016 saw many states stepping back from mechanisms set up to underpin international security. For instance, four nations left the International Criminal Court. The past year also saw major powers accusing each other of undermining the global security balance and interfering in domestic politics. This instability led regional powers and smaller nations alike to consider new conventional, cyber or even nuclear weapons. Extreme weather events are rated second in line for impact, with water crises, natural disasters and climate change making up the rest of top five concerns. Involuntary migration and food crises add to the societal risk factors considered to have high potential impact, with geopolitical threats such as terrorist attacks and interstate conflict also featuring in the top ten. The impact of unemployment is the only economic risk within the top ten. It reflects the increasing polarisation and inequalities resulting from weak economic recovery and fast technological change. While a trend which previous reports had also highlighted, it has become exacerbated over the last year, and is related to a number of other trends such as social instability and the rise of populism. The impact of unemployment or underemployment has been drawing ever wider circles, making it the number one risk to business identified by the Global Risk Report. Significant energy price increases or decreases, threatening to place further economic pressures on highly energy-dependent industries and consumers, were ranked as the second most important risk to business. Concerns over possible fiscal crises came third, reflecting concerns over excessive debt burdens that may generate debt or liquidity crises. Failure of national governance was rated the fourth biggest risk to business globally. This could be anything from a failure of the rule of law, corruption or political deadlock rendering a country of geopolitical importance unable to govern itself. Respondents from Latin America picked this as the biggest risk for business in their region. However, we need to look no further than Spain , where a caretaker government had to hold the fort when elections did not deliver a majority for any party to rule. 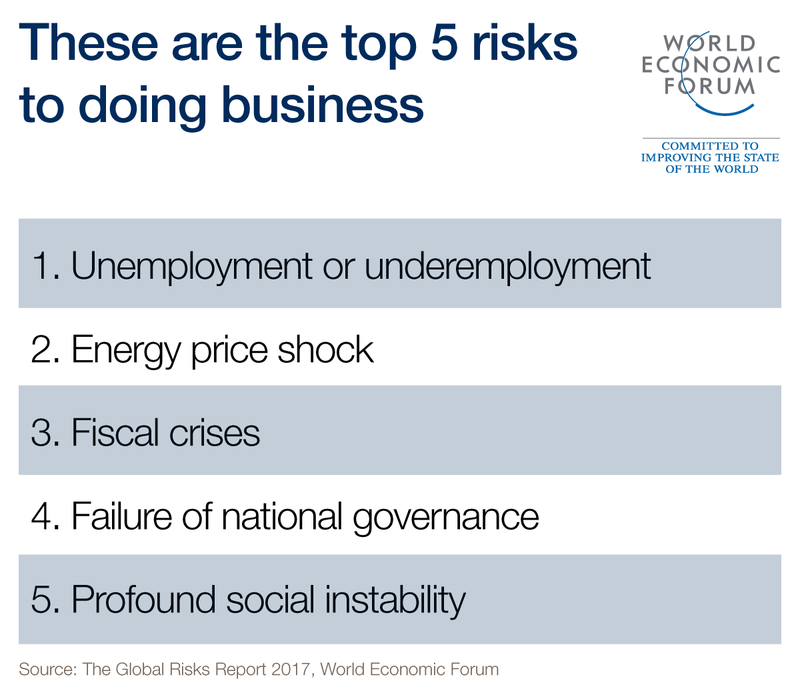 The top five business risks is completed by concerns over profound social instability, which paired with unemployment, was the strongest connection of global risks the survey found. To tackle these socioeconomic challenges the most pressing need is to get the global economy back on a strong growth path. However, the report surmises that boosting growth in itself would not heal the deep social rift between the ‘haves’ and ‘have nots’, calling for wider reforms of market capitalism. At the same time, the World Economic Forum highlights the need to rebuild national communities which have drifted apart, not just because of economic disparities but also due to sociodemographic and cultural changes. In terms of the wider global risk landscape, the report concludes that many of the top concerns highlighted – geopolitical tensions, environmental threats and societal risks – cannot be addressed on a country by country basis. They require strong international cooperation and responses. However, rather than stronger cooperation, the last year has seen countries around the globe shift from an outward-looking to a much more inward looking stance. Therefore, protecting and strengthening the mechanism of global cooperation will be a key challenge for 2017. How to address the world’s most pressing risks will be the subject of discussions at the World Economic Forum Annual Meeting 2017 , which convenes 17-20 January under the theme Responsive and Responsible Leadership .